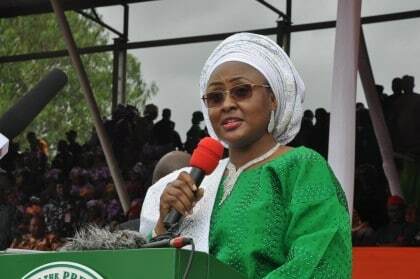 Wife of the President, Mrs. Aisha Buhari, has been appointed the Chairperson of All Progressives Congress (APC) Women and Youths Presidential Campaign team for the 2019 election. The wife of the Vice-President, Mrs. Dolapo Osinbajo, is also appointed as the Co-chairman of the campaign team. This is contained in a statement made available to the News Agency of Nigeria (NAN) on Tuesday in Abuja by the Director of Information, Office of the Wife of the President, Mr. Suleiman Haruna. Other executive team leaders include Mrs. Adejoke Adefulire as Vice Chairman (South), Mrs. Mairo Al-Makura as Vice Chairman (North), and Barr. Juliet Ibekaku-Nwagu as Deputy National Coordinator (South). According to the statement, Hajiya Binta Muazu would serve as the Deputy National Coordinator (North), with Mrs. Rashida Yahaya Bello as Zonal Coordinator North Central, Mrs. Hadiza Mohammad Abubakar for North East, Dr Zainab Atiku Bagudu for North West and Mrs Nkechi Rochas Okorocha for South East. Mrs Florence Abiola Ajimobi would coordinate women and youths from the South West zone while Mrs Judith Chibuike Amaechi would coordinate the South-South women and youths for the exercise. Those that made the list include the Minister of Youth and Sports, Mr Solomon Dalung; Comptroller General of Customs, retired Col. Hameed Ali; retired IG-P Suleiman Abba; retired Brig.-Gen. Jafaru Isa, retired Gen. Buba Marwa; Chief Orji Ozu Kalu; Chief Sullivan Chime, and Sen. Ali Modu Sherrif.